It's already the second week in January and I'm thinking back to how I've been doing on my goal for this year: to live life more purposefully. I'd say that's pretty good, considering in years past, I would have lost my list of resolutions or forgotten them by now. There are two behaviors that are often stumbling blocks to being more focused and deliberate about my tasks. In the past these are things that helped me cope with a full and busy life, but now I'm finding that they can get in the way of enjoying and appreciating my life. The first is the ability to handle distractions. When I was a young mom, I remember someone telling me that one of the hardest things about parenting young kids is that, while many jobs require you to be able to switch gears at a moment's notice, with kids the distractions are often so jarring. You're doing a task and a baby starts wailing. Kids start fighting. Or demands are immediate. A baby throws up, a diaper needs changing now. You always have to be on your toes. So, we're conditioned to distractions occurring and handling them becomes second nature. It's not even natural to begin and complete a task in one sitting. I wonder if all of this has contributed to my mid-life attention deficit? 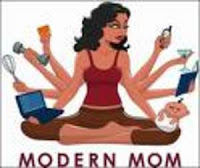 The other coping skill that moms learn to master is multi-tasking. Hold the baby, stir the soup, talk on the phone and keep an eye on the preschooler. Make supper while overseeing homework and running a load of laundry. Even though my kids are older now, I'm still in that mode. I may not be called on for dirty diapers or feedings, but suddenly someone needs a ride somewhere or help with a math problem or there's a wardrobe crisis. I've learned to drop what I'm doing, switch gears and tackle whatever has become the new priority. And, after years of this, I find myself and my friends saying the same thing. We're on the run, we always doing, the time is going by, and at the end of the day, what have we accomplished? I know I've done a lot, but where's the fulfillment? Multi-tasking and fighting distractions are hardly conducive to leading a purposeful life. So, here are a couple of areas I've been working on. One is finding routines that work. And not procrastinate them! Oh, I'm so good at putting things off. And the second area is to take advantage of the time I have alone, so that when the kids are home and I'm on duty, so to speak, I'm more available and not multi-tasking. Nothing earth shattering here, but just a few thoughts to help me on my journey this year. Not earth shattering, but true nonetheless! We could all stand to stop and enjoy the time we have alone, so that we can regroup and equip ourselves to handle the next crisis! Good thoughts, too. I find sticking to a routine really keeps time free for me too. Otherwise the day just seems to fill up with other "stuff." Great goal, btw, to live more purposefully! I think you are doing a fab job friend. But you are so right with multi tasking and life in general. Breathe....and you will get there. Live in the moment baby. I was never blessed with children, but reading your post makes me so appreciate all of the Moms out there who are able to multi-task. You have amazing talents and to have a goal of some quiet time seems more than reasonable. I love reading about your journey. Thank you so much Karen! Ive only been a blogger for a few days and I am already enjoying it so much! I don't even remember how we got her to let us wrap her head in a blanket but I just love that picture of us! Karen I think you will find this true of so many of us. While my children are so much older then yours, I still had the distractions in other areas. That said I can relate to the need to get things under control. Being able to focus and finish one thing at a time is a HUGE challenge for me. So I wish you well and send support your way. I like this, and it makes sense. It's interesting to consider that methods that were excellent in the past may be holding us back today. I'd say that your kids are getting old enough these days that you don't always need to be the savior of the household. Let them decide how things should be handled at times. I'm going to think about how this line of thinking applies to my life today. Oh, that's so true. Isn't it funny how a skill can be so helpful at times when we have so many demands on our time, but when we want to accomplish one or two things, we have to do the complete opposite. I think this is one thing I'd like to do as well: to live each day purposefully. To know what I want to accomplish, and to keep from getting sidetracked. That's my nickname for myself: So Easily Sidetracked.